I’m always looking to add more chicken recipes to my arsenal, specifically those using boneless, skinless chicken breasts because they are so loved by my family and everyone else’s too, it seems. 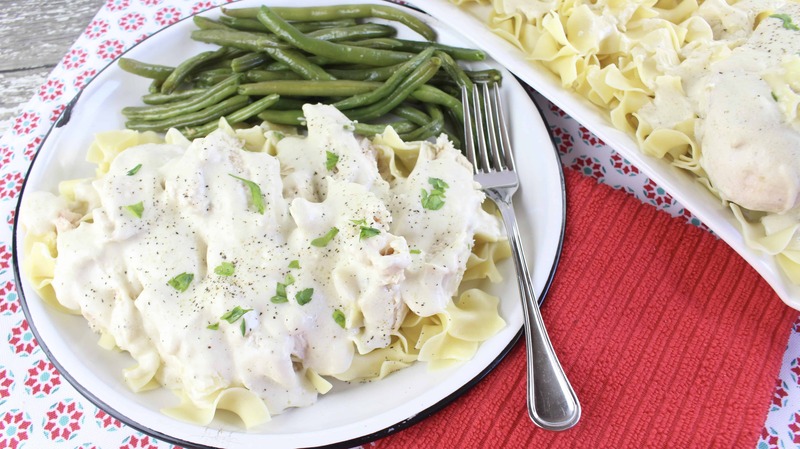 This flavorful chicken dish has a delectable sour cream gravy. Smooth and creamy, it’s the ultimate compliment to juicy cooked chicken and even better when you have egg noodles to sop it up. Last week my husband and I marked our 19th wedding anniversary. As proof that he knows me well, my husband offered to either take me out to supper or get takeout from a place of my choosing and bring it home. I chose home – he knew I would. 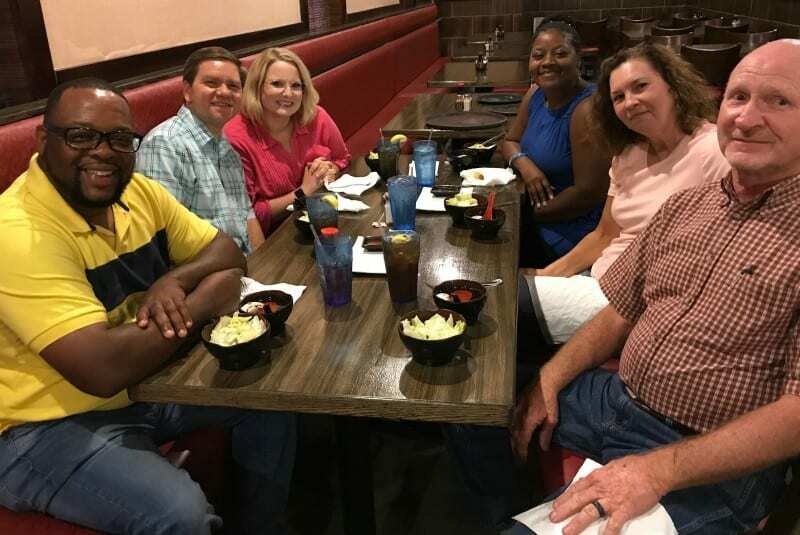 Later that week, Saturday evening to be exact, we went out with some dear friends from our church, photo below. All of this got me to thinking about what encouragement I would give young people, or people of any age really, who are thinking about marriage or recently married and since this is the internet, I have a blog, and no one asked, I’m gonna share that encouragement with you today. But first, a disclaimer for 2017: Personal opinions and personal experience will be shared in the paragraphs below. These opinions and experiences may differ from yours – because they are not yours, they are my own. ~Whoa! Technology!~ Now let’s dive in. The marriage is way better than the wedding. I know folks like to have big old ceremonies and such and, while that is not for me and I personally think there are better ways to spend the money, I’m really not knocking huge weddings. BUT, as awesome (or in my case, grueling) as you think the wedding is, the marriage is way better. The ceremony is one day in your life. For me that was one really long very hot day in an uncomfortable dress having to be the single focus of a few hundred people (who quickly learned that I was NOT going to dance) and then spend the next few months finding rice in everything. For you, it may be the highlight of your year. Regardless of how you view the wedding, the marriage is a joint commitment to love, support, and encourage each other for the rest of your life – which is WAY better than any single day. People change, married people change together. People change as they grow older. The cool thing about being married is that we get to experience these changes together. Expect your partner to be an entirely different person ten years from now, and another one in twenty. This is even more true during the younger more formative years. Stability comes later in life but its much more fun if you’ve been able to experience the richness and depth of your spouses personality leading up to that point. We all have passions and it is wonderful to be able to share those with someone, especially if it is a passion they would not normally have explored without you. I am currently trying to feign interest in 3-D printing and Ricky is having to deal with my newfound love of making Challah. When bonds are strained, they grow back stronger. Know that there are rough times ahead. You cannot live with someone and like them all of the time. At least some or all of the following are most assuredly ahead of you: babies and colic, sleepless nights, depression, grouchiness, job loss, money anxiety, accidents, and illnesses. These will try your patience and wear on your nerves. But hang in there, go through it together, and on the other side you will find yourself with a far stronger relationship than you ever dreamed possible – and a security that comes from knowing that no matter what- the two of you won’t quit one another. The other side of each trial and phase of life is better than ever and you’ll find that your relationship gets stronger, more secure, and more comfortable as life goes on. My husband and I got married in the late nineties. We were young, carefree, and fun people looking forward to a promising future. If we would’ve had Facebook back then folks would have looked at our feeds and thought “They have a great life!”. But you know what? Twenty years later, with kids ages 18 and 12, more than full time jobs, wrinkles, and responsibilities galore – we have more fun together than we ever have. We are relaxed, we are secure, we know each other’s sense of humor, likes, dislikes, and we know what to expect from one another. Through the years our lives have melded together to form a single machine that just runs smooth and steady – and that is a direct result of time, trials, experience, and commitment. So I want to encourage you young married folks or young engaged folks that no matter how awesome life is right now, aging together only makes it sweeter. Kinda like how grape juice turns into wine – except Ricky and I can’t stand the taste of wine and don’t even drink alcohol so that analogy is awkward at best for me to pull off – but you get my point. You’re grape juice now but later you’ll be wine – but you’ll be good wine that tastes like grape juice does to me and Ricky. I’m glad I could confuse encourage you today. Another assurance of marriage – you’ll have a lot of suppers together :). Add this one to the list. You’ll need: boneless skinless chicken breasts, butter, chicken broth, sour cream, garlic powder, flour, and salt and pepper to taste. As always, the exact ingredients are at the bottom of this post in a handy, dandy printable recipe card. 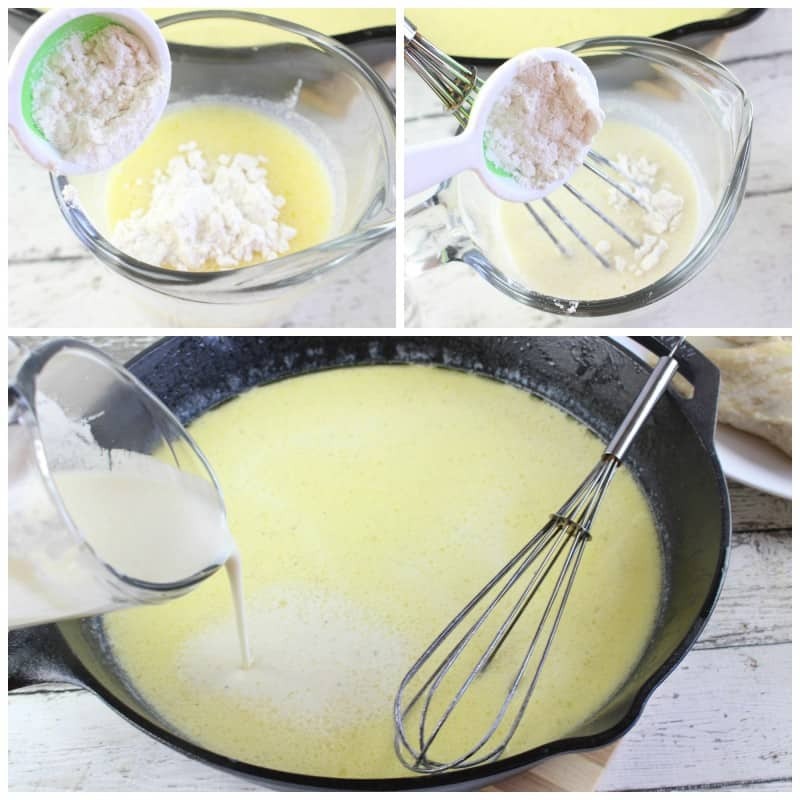 Melt your butter in a skillet over medium to medium high heat. Add your chicken breasts and cook until lightly browned on each side, but not cooked through. Add chicken broth to the skillet and reduce heat to low. Simmer for about ten minutes or so, or until chicken is cooked through. To that skillet (and broth) add sour cream, garlic powder, salt, and pepper. Stir with a wire whisk until smooth. Now we need to thicken this a bit. Remove about 1/2 cup of chicken broth and stir your flour into it until smooth and all the clumps are gone. Pour that back into your skillet and return to low heat. Stir with a wire whisk until gravy is thickened. Return chicken breasts to skillet and stir to coat. At this point you can serve them as they are atop a bed of noodles or cut them in pieces and place them on the noodles. Either way you go, spoon extra gravy on top! 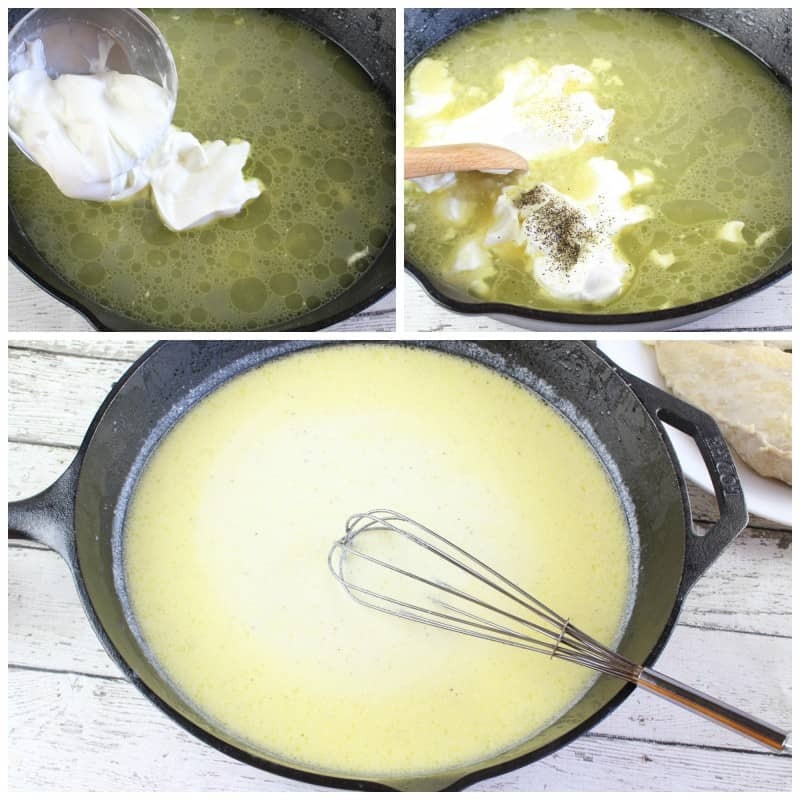 Melt butter in large skillet over medium heat. Add chicken and cook until very lightly browned on both sides but not cooked through. Add chicken broth to skillet and reduce heat to low, simmer for about ten minutes or until chicken is cooked through. 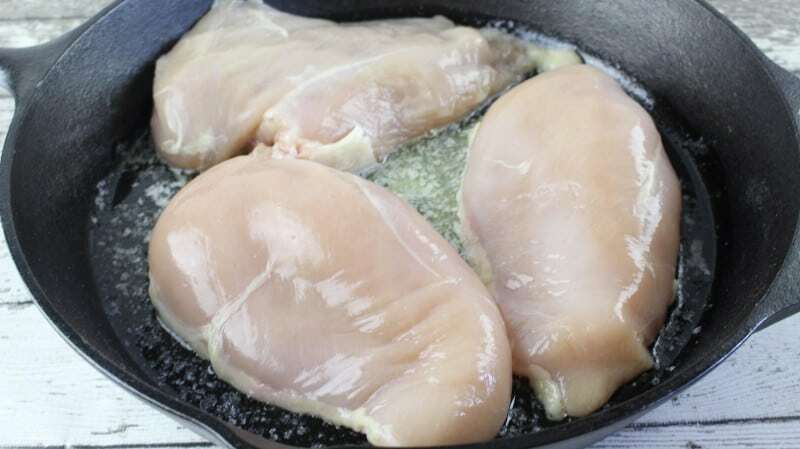 Remove chicken from skillet and place on plate. 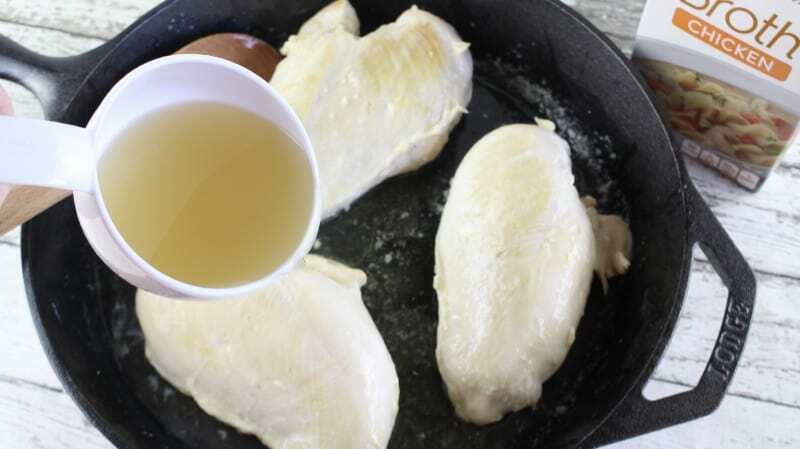 Leaving chicken broth in skillet, add sour cream, garlic powder, salt, and pepper to skillet. While still cooking on low, stir until sour cream is melted and fully incorporated. Remove about 1/2 cup of liquid and stir flour into it until smooth. Pour back into skillet and stir with a wire whisk until gravy is thickened and smooth again. Add chicken back and turn to coat. Serve chicken and sauce immediately over egg noodles. This recipe is part of the Weekend Potluck! What a sweet post. Congrats to you and Ricky. This recipe looks like your marriage..a keeper. I totally agree with you, I married at 18 and almost 30 years later we are NOT the same as back then–we are better! And on the wine thing, I agree there, too. Wine is icky, can’t understand why people always act like it is so good. I loved reading this post and agree with you. Your chicken looks delicious too! YOU are such a sweetheart !! Thank you so much for your awesome notes and recipes!! This looks so good! Pinning this one as I do most of your recipes. Congratulations of 19 years of marriage! Do you think this would freeze OK after it’s all cooked? I’m generally hesitant to freeze things in white sauces, but maybe it would still be gravy-like after thawing?? (or would it turn watery ? 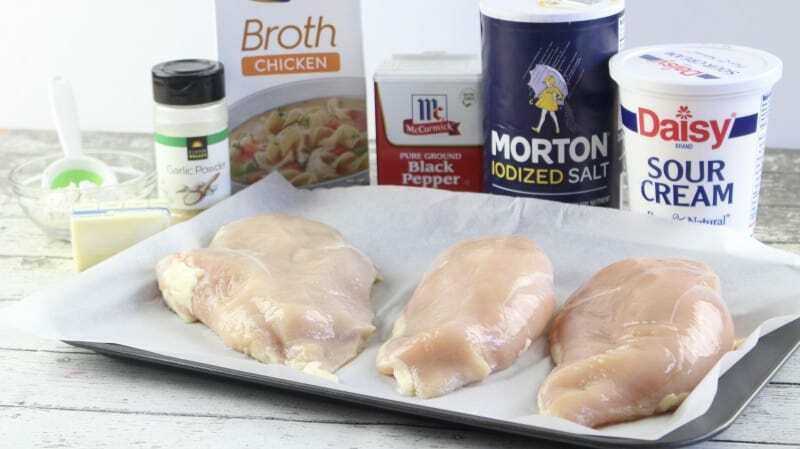 – yuck) I have lots of chicken that must be cooked or frozen tomorrow, and I know my family will love this – would love to make a huge batch and then freeze. Thanks for any advice. It probably would be better to freeze before thickening the gravy. When you remove from freezer defrost, then heat on low to heat chicken then thicken as called for. This is delicious! I generally avoid freezing cream sauces as well but I think Marie’s suggestion was a really good one! Amen to everything here, Christy! Pinned the recipe so I get it on my next menu plan! Thanks!!! Let me know what he thinks Claudia! God Bless and tons of hugs to you!! Happy 19th Anniversary! I believe just like you do about marriage. This sounds delicious and I would be making it now but I don’t have any chicken until I go to the store. Thank you Bev!! I hope you get the chance to try it soon!! My husband and I had 40 years 4 months & 11 days of marriage….he passed away last September. We struggled a lot, we had many problems and discouragements. We held and kept going and things started getting better and better We had a wonderful routine worked out the last 7 years….then we found he had pancreatic cancer. I wonder why God brought us so far and the took him away…..We were kids when we married and no one thought it would last…….I only wanted a few more years, I wanted 50 years I wanted a big 50 year celebration, to show everyone what we had over come. I didn`t get that and no one even remembers what we struggled with, what we overcame, they only remember Kenny as a friend, a minister and that he was married to me. Now my pity party is over…. I am so sorry about your loss Margaret, I will put you in my prayers. I hope you get the chance to try this soon, I would love to hear what you think! I really can’t stand the taste/texture of sour cream, so I usually replace it with yogurt. Would that work for this recipe? Or can you not even taste the sour cream? You can certainly replace it with yogurt although in this recipe it really doesn’t taste like sour cream, it’s more of a savory gravy. I have never ever heard of sour cream gravy. I am always happy to try a new recipe. We are coming upon our 40th anniversary very soon. Congrats to you and your honey. I hope you get the chance to try it soo and congratulations to you and your honey as well!! My husband and I have been married for 28 years. You may never know or understand what other people see until they put it into words. The other night, our 19 year old daughter said, “Mama, that’s what I want from marriage,,,, a friend for life!” I never thought about that way, but that’s what she sees when she sees us… always together, doing the day to day stuff, always including each other….A friend for life! 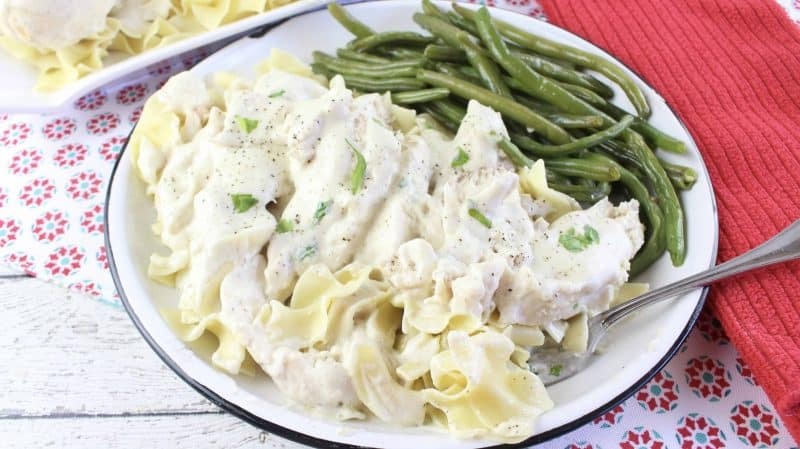 With the sour cream in the gravy this recipe you could probably call this recipe “chicken stroganoff”! I love the tang of sour cream gravies. I made this for supper tonite. I served mine with french style green beans and Ed had brussels sprouts. Golly it was fantastic. I swirled my beans in the gravy and noodles and oh man was that heavenly. I will be serving this again soon. 4 big portions mean leftovers for the fridge and saving me from cooking tomorrow night..we love leftovers. You don’t mention tempering the sour cream with some of the broth, so I assume it’s not necessary to prevent curdling? Hubby and I celebrated 43 years of marriage in June! Thank you for another fabulous looking recipe! This will be great with leftover turkey from Thanksgiving. As another person commented, I too had never heard of sour cream in gravy, but this sounds intriguing, the breasts, I have thawed for tommorow will definitely be served with this gravy. Will halve recipe as, I live alone & will get 2 meals out of this. Thanks for sharing not only recipe, but heartwarming story!! I actually make this frequently especially with leftover chicken breasts. However, i tend to add a little Asiago cheese and some rosemary to my sauce. Looks like a great recipe and I have everything I need to make it!!! I remember one of the times in your life that was closer to wine then to grape juice…after your horseback ride. However, like always, your sweet spirit just kept on shining! I personally thought this was a terrifically delicious recipe, but my husband greatly thought otherwise, sorry, Christy. However, I have enough leftovers that I divided them out for my lunches for much of the week! Thanks for sharing, as I will be making this again in the future, but for myself. Happy belated anniversary! This was a really great post! We all have different taste buds, but I am glad to hear that you liked it!! Is this the same recipe to use for the velvet pork chops? Every link from Pinterest for those sends me here. Help! I’m dying to make those chops! Hey Valeri! I’ve redirected that link for the time being until I can modify that post. The velvet sauce will be back soon! Yum. Makes me think of beef stroganoff, but with chicken. You are correct Jackie, it is similar!! Good Morning, Christy and thank you for your lovely gift of words on marriage as well as your delicious chicken recipe! I’ve pinned it all and will share this lovely post onto Facebook! At the age of 69, I am blessed with 3 dear, grown children of my own, 2 wonderful step sons and 9 precious grandchildren! As you can well imagine, my life story is full of all of the things you offered above and then some; some of which was not to my liking. However, my new, sweet and gentle husband and I are 10 years into a lovely marriage in which we can now grow old together. Perhaps life has a way of turning around for those who are patient. I certainly do enjoy your delightful blog! Thank you for all you stand for and all of your delicious recipes!! Thank you so much Lucy, that means the world to me! !i am so glad to hear that you have found your forever. I do agree that sometimes it just takes a bit of patience and waiting on God’s timing. If more couples spent as much time and energy on their marriage as they do their weddings, I don’t think we would have so many divorces. They seem to treat the wedding as the ending rather than the beginning of the rest of their lives. 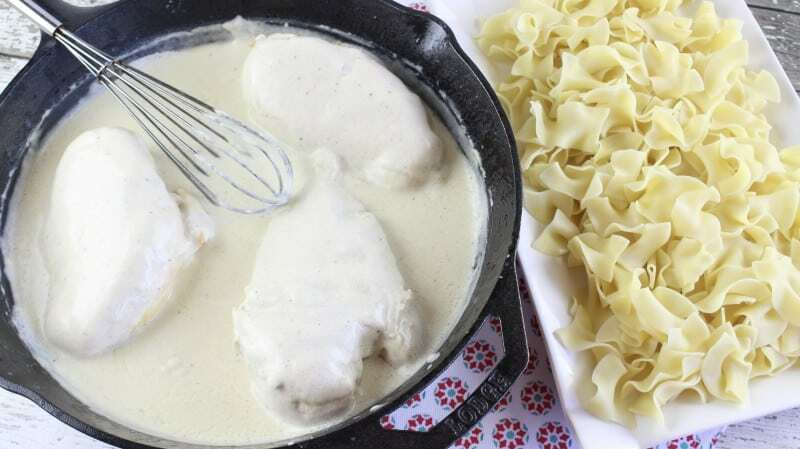 Another great recipe with my favorite chicken and noodles!!! Thank you so much! !